In September 1965, Mary Ann Hubschman and her husband Richard designed and built a preschool called “Humpty Dumpty Nursery School” in Fort Lee, NJ. Mary Ann along with her colleague, Barbara Greenberg welcomed thirty three (33) children between the ages of 3 and 4 to her new, state-of-the-art preschool. It was the only local school of its kind built specifically for the young child. The school’s educational philosophy focused clearly on the intellectual and social growth of each child. After two years, with great success and in keeping with Mrs. Hubschman’s philosophy, the school was renamed “Palisades Preschool & Kindergarten.” Today, after 50+ years and over 150 children yearly in attendance, Palisades Preschool & Kindergarten’s excellence in the field of early childhood education is well known throughout the area. Past alumni now return with their own children and share fond memories of their own first school experience. 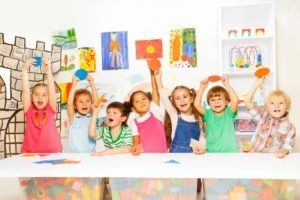 Over the years, many parents having moved to communities north of Fort Lee, were requesting that Palisades Preschool continue its success by opening another school, closer to their new homes. In 1993, a new location was found. In September 1993, Palisades Country Day School, in Closter, NJ opened with an enrollment of 150 children, ages 2 to 6. A third school quickly followed and the total enrollment rose to over 400 children in the year 2000. Mary Ann Hubschman, the director of all three schools, continued to stay true to her original plan of creating a quality preschool – a school that recognized the values of nurturing and learning together. Since its inception in 1965, Palisades has remained committed to the whole child, in experiencing the joy of discovery as he/she move from the safety of home and family to that of our schools.